Fox fur coats, which had once waned in popularity, have made a dramatic comeback. With distinctive coloring, long fur, and easy maintenance, fox fur coats in Chicago are in demand. If you’re considering buying fox fur coats or accessories, here is what you need to know. Fox fur is longhaired, which makes it very warm. For this reason, it is especially popular in cold climates. Even when its popularity temporarily dipped in the U.S., fox fur coats were still extremely fashionable and sought after in Europe and Russia. Because of the popularity of fox furs in these markets, much of the fox fur that is used for coats and accessories comes from ranchers in these regions. Scandinavia in particular has large numbers of fox furriers and is a major supplier to the world market. At one time, fox fur had a very distinctive, reddish hue. Now, with a variety of ranching practices, plus the popularity of dyeing fur, fox fur coast come in a number of different colors. Blue fox fur ranges from white with bluish highlight to blue with brown and pure blue. Cross fox fur has red and yellow tints, while gray fox fur mixes gray fur with red highlights. Plantina fox fur is highly prized and has a platinum look mixed with white fur that has been lightly bleached. White fox fur often has a blue tint and has an especially thick underfur, which makes it one of the warmest options. 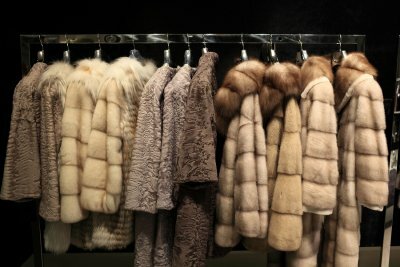 Fox fur can also be dyed in an endless array of colors, which means it is easy to incorporate into any wardrobe. Fox fur is especially durable and requires only a minimal amount of care. Regular cleaning keeps the fur looking full and the skin supple. As with all types of fur, it is important to store all of your fox fur coats and accessories properly, using fur cold storage, and to get any necessary repairs done professionally. White fox fur requires the most attention and may need to be professionally bleached periodically to prevent yellowing.